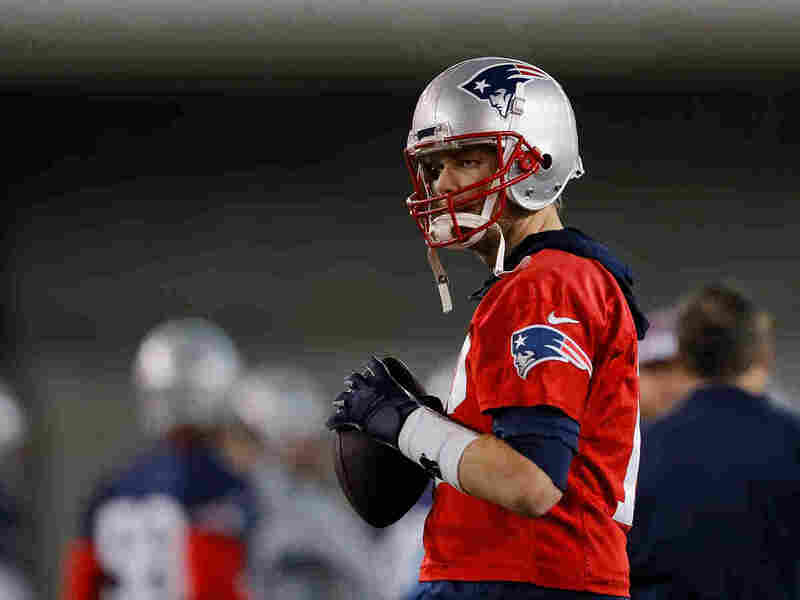 Patriots Vs. Rams: What To Watch For In Super Bowl LIII Sunday's Super Bowl pits the New England Patriots against the Los Angeles Rams. LA's talent-packed offense gives New England's head coach Bill Belichick a tough choice on who to target. New England Patriots quarterback Tom Brady during practice ahead of Super Bowl LIII. In 2002, the Patriots were led by second year head coach Bill Belichick and second year quarterback Tom Brady. In 2019, they're appearing in their ninth Super Bowl together — they've won five — and they are considered by many to be the GOAT of their professions — Greatest Of All Time. In 2002, the Rams had the league's most combustible offense. Averaging 32 points per game for the entire season leading up to the Super Bowl, the Rams were nicknamed "The Greatest Show on Turf." 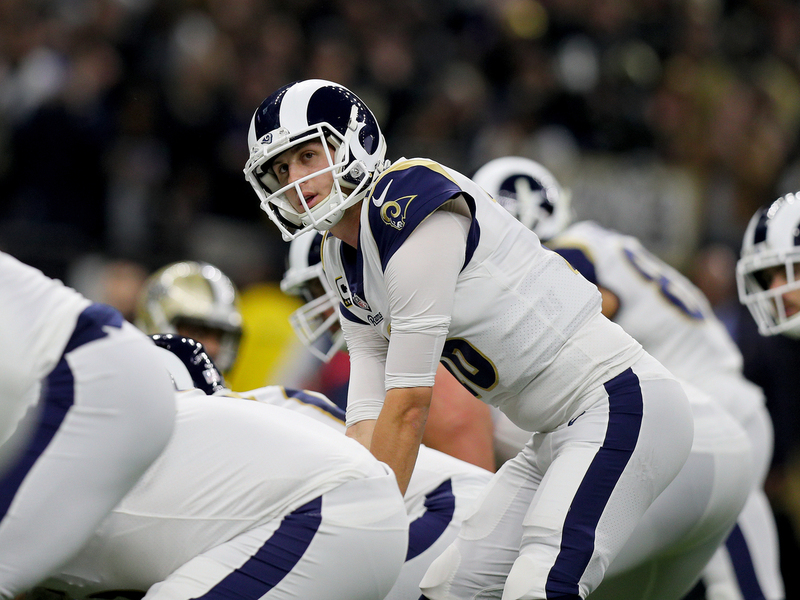 In 2019, the Rams again are an offensive juggernaut, again averaging 32 points per game for the entire season leading up to the Super Bowl. New England won Super Bowl XXXVI by a score of 20-17 and they did it by grounding the high-flying Rams' offensive attack. Specifically, Belichick set the tone for the team's future success by identifying the Rams' offensive strength, and then neutralizing it. Rams all-pro running back Marshall Faulk was the man in the crosshairs, and New England battered him, holding Faulk to a pedestrian 76 yards rushing and no touchdowns, and successfully flustered the St. Louis offense in the process. 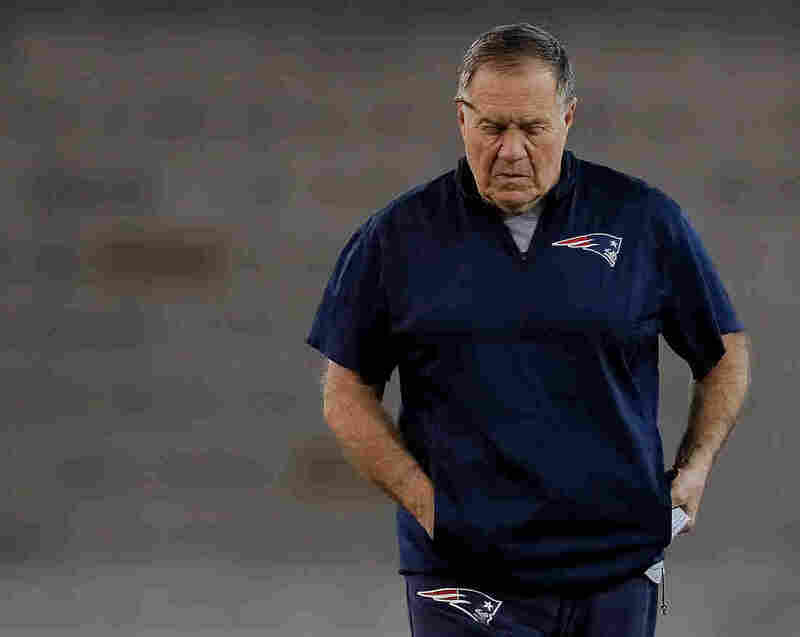 Will Belichick and the Patriots have the same success against the 2019 Rams? 1) Who exactly do the Patriots neutralize? The Rams are loaded with offensive talent, but here's the challenge for Belichick: there's no real key to LA's offense. Shut down star running back Todd Gurley (more on him coming up), and suddenly resurgent C.J. Anderson will hurt you. Commit to stopping wide receiver Brandin Cooks, Robert Woods will fill the void, and vice versa. Josh Reynolds also is a dangerous pass catcher. There are two tight ends who contribute to the offense. And tying it all together is young, up-and-coming quarterback Jared Goff. Of all of those, Goff may be the man Belichick singles out. Jared Goff of the Los Angeles Rams takes a snap during the second half of the NFC Championship game on Jan. 20, 2019. Belichick has had two weeks to figure out a plan. Most assume he's concocted something ingenious. Or? Are the Rams simply too dynamic, too versatile to stop with 33-year-old head coach and offensive mastermind Sean McVay calling the kind of game that leaves the veteran Patriots trying, and failing, to keep their balance? It's totally unfair to distill a football game, with all its working parts, down to two opposing players. The sports media do it as a lazy way to gin up interest. "Ooooo, it's Brady versus Goff for Super Bowl LIII!" But in this case, it's fair to say whoever wins a battle between Brady, New England's GOAT quarterback, and Donald, LA's defensive tackle of the moment, could signal who wins the game. 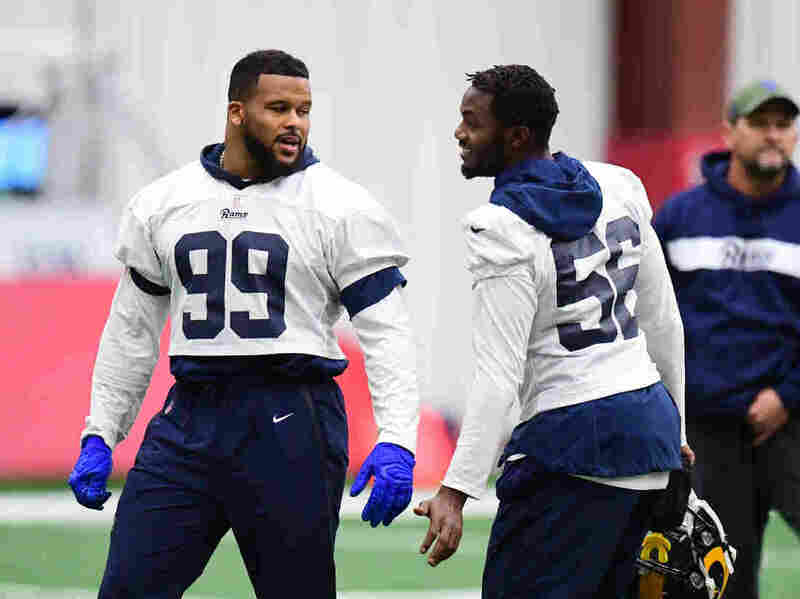 Aaron Donald, pictured left, and Dante Fowler, Jr. of the Los Angeles Rams chat before practice for Super Bowl LIII on Jan. 30, 2019. Today's NFL is about passing, on offense, and trying to disrupt the passer, on defense. There's a premium on lightening quick pass rushers — Khalil Mack transformed Chicago's defense and the entire Bears team into a fearsome opponent. Likewise, Donald has become the face of a menacing Rams pass rush. His practice regimen of catching a tennis ball ball before it bounces twice doesn't seem particularly menacing. But when the tennis ball becomes a quarterback? Quarterback beware. Which is what Brady will have to do Sunday. But there's a reason Brady is not only standing at 41, but thriving. He's a master at getting rid of the ball quickly, around two-and-a-half seconds on average from snap to throw. There are other elements, including New England's diverse and effecting rushing attack, that allow Brady to remain largely untouchable. But the quick pass is a key, and it presents a challenge for Donald, Ndamukong Suh and the rest of the Rams rushers. Can New England's underrated but very good offensive line contain Donald, keep him from breaking through the middle of the line and give Brady those precious two to three seconds? If so, the Patriots have a much better chance for success. If not, advantage Rams. 3) Which Todd Gurley will show up? For most of the 2018 season, Todd Gurley again was one of the best running backs in the NFL. He led the league in regular season touchdowns and was third in yards gained. 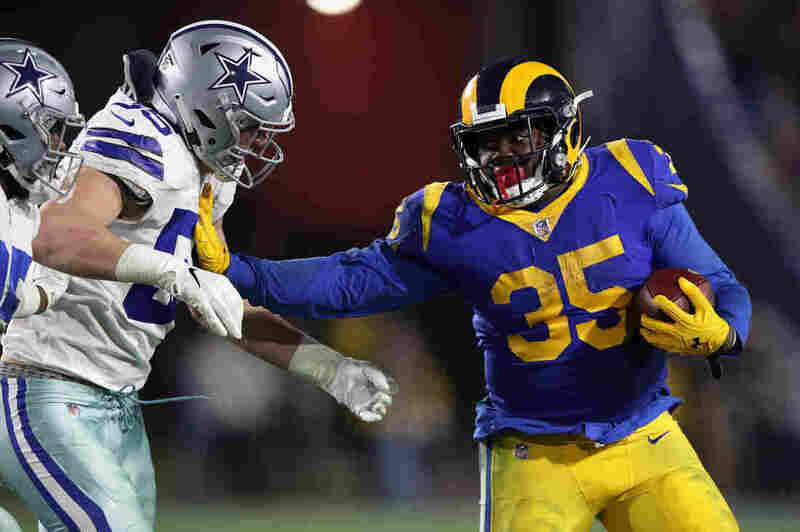 He was slowed at the end of the season with an injured knee, but returned in the Rams first playoff game, a win over Dallas in which Gurley looked like Gurley — 115 yards and a touchdown. The thing was, in that same game, another Rams running back stole the show. C.J. Anderson ran for 123 yards and scored two touchdowns. LA signed Anderson late in the season. He played in two Super Bowls for the Denver Broncos, and was a major contributor in Denver's 2016 Super Bowl victory over the Carolina Panthers. The Broncos released Anderson last year. He cycled through two teams before signing with LA less than two months ago. And he's been a revelation. Anderson has turned the Rams rushing attack into a two-headed monster. 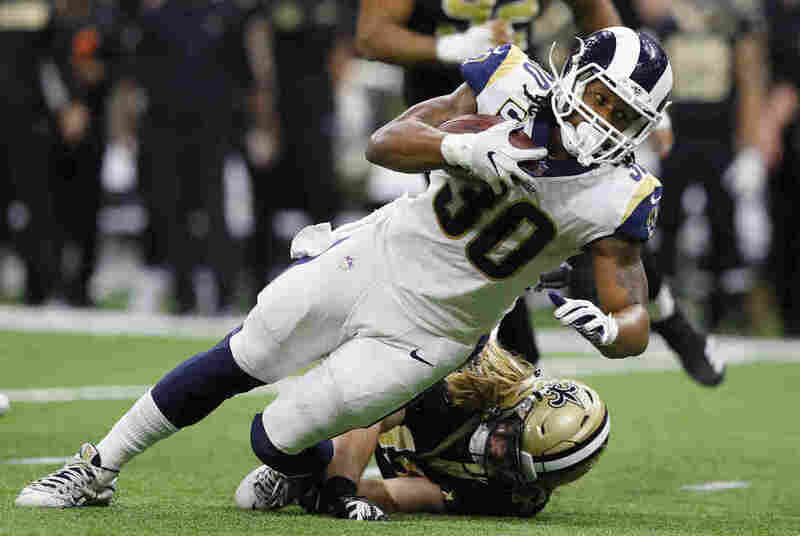 His different style of running from Gurley, more straight ahead, low to the ground — he's only 5'8 — allows the Rams to vary their attack within a game, which leaves defenses trying to react quickly. Anderson, in fact, was the featured back in LA's NFC Championship game win, even though Gurley reportedly was healthy. Gurley's measly four carries in that game was a major topic of conversation and concern afterwards — head coach McVay kind of defused things with his post game comments. Rams quarterback Jared Goff said he expects Gurley to have "a hell of a game in the Super Bowl." But will he? This take says Anderson should be the preferred runner because of his loose hips and ability to head outside but then cutback to inside rushing lanes. Gurley has MVP talent. But in Atlanta, Anderson may have the ball. 4) Will the halftime show be more than music? A number of high profile artists, including Jay-Z, Rihanna and Cardi B, turned down the chance to perform at halftime as a way to support former San Francisco 49ers quarterback Colin Kaepernick. In 2016, Kaepernick became the first player to take a knee during the national anthem as a way to protest police treatment of minorities and social injustice. He filed a grievance against the NFL alleging teams have colluded to keep him out of the league. Asked about Kaepernick at his pre-Super Bowl press conference this week, NFL Commissioner Roger Goodell said, "I think if a team decides that Colin Kaepernick, or any other player, can help their team win, that's what they'll do. They want to win and they make those decisions individually, to the best interest of their club." In response, Kaepernick's lawyer, Mark Geragos said, "I think the Commissioner was roasted appropriately on social media [for his comments]. Anybody who believes that will believe that Mark Sanchez [a journeyman quarterback signed this year by Washington] was a better choice, or some of the other, how shall I put it delicately, people that were well past their prime that were signed this year." The halftime show now is part of the Kaepernick controversy. 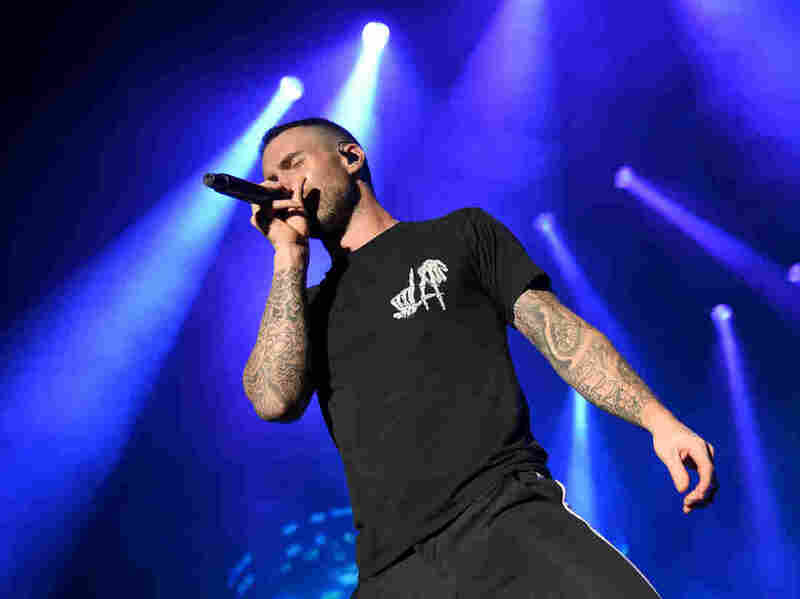 Maroon 5 signed up as the lead act and the band will be joined by rappers Travis Scott and Big Boi. A petition asking Maroon 5 to drop out has gotten more than 100, 000 signatures, and there have been calls for the performers to take a knee in solidarity with Kaepernick. In an interview, Maroon 5's Adam Levine said activists "will be [heard], that's all I want to say because I don't want to spoil anything." Adam Levine of Maroon 5 performs during the NCAA March Madness Music Festival on April 1, 2018. No follow up to that comment, because the NFL cancelled a Maroon 5 press conference this week in Atlanta. 5) You wanna bet? CBS doesn't. In May of last year, the Supreme Court struck down a 26-year-old federal law banning sports betting in most states. In the 6-3 opinion, Justice Samuel Alito wrote, "The legalization of sports gambling requires an important policy choice, but the choice is not ours to make. Congress can regulate sports gambling directly, but if it elects not to do so, each state is free to act on it own." Several did, and they're hoping to take full advantage of the Super Bowl, aka the biggest sports betting day of the year. People in Rhode Island, Delaware, Mississippi, New Jersey, Pennsylvania, West Virginia and the District of Columbia, who want to lay down bets on the Patriots, Rams, or the over/under on the length of Gladys Knight's rendition of the national anthem, can stay home instead of travelling to Nevada, which basically had a monopoly on sports gambling until the Supreme Court's decision. But despite the decision, CBS won't say a peep about it during its broadcast of the game, or during the pregame show. "It's only legalized in a few states," says CBS Sports chairman Sean McManus. "We just had made the decision that it's not the right thing to do now." Critics say CBS's decision is shortsighted. According to the American Gaming Association, 22.7 million American adults plan to bet a total of six billion dollars on the Super Bowl. "It's real. It's happening and you're sticking your head in the sand if you're an executive and you don't at least address it," says former veteran network sportscaster Brent Musburger. He now works for VSiN, a national sports gambling news network in Las Vegas. "There should be part of the [Super Bowl] pregame show, in fact the last hour should show some of the crowds in New Jersey because it's coming," Musburger said on the Sports Illustrated Media Podcast. McManus says the ban on gambling talk isn't new and that it includes college football telecasts of the SEC on CBS as well as the NFL. He adds, "We're very flexible, and we're talking to all the different gaming companies out there. We may change, but right now, we've decided not to do it." So those tuning in to hear CBS analyst Tony Romo's popular predictions won't hear anything about point spreads or prop bets. Although Romo did offer a little guidance during a pre-Super Bowl press conference this week. "I'm going to go 28-24," Romo answered when asked to predict a final score. "And I think the team who has 24 has the ball at the end, and they don't score." It's up to bettors to figure out which team scores 28 and which scores 24. Because Sunday, Romo won't be giving up anything else. Network orders.